Symptoms may appear at any plant age and include wilting and yellowing of leaves and stunting of plants. Disease may be severe in young, succulent plants and may appear as rapid wilting of leaves and collapse of stems. Initially, only one stem may wilt. If conditions are optimal, all the leaves in a hill may wilt quickly but remain green. Stems may appear streaked as infected vascular bundles become visible. Tuber vascular tissue is usually a distinct grayish brown, and the discoloration may expand into the pith or cortex. 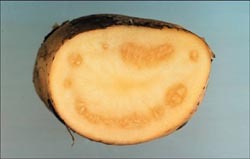 Tuber eyes turn grayish brown, and a sticky exudate may form at the eyes or where the stolon is attached to the tuber. Eventually, infected tubers left in the ground will turn into a slimy mass surrounded by a thin layer of outer tissue and periderm (8). Potato tuber with brown rot. 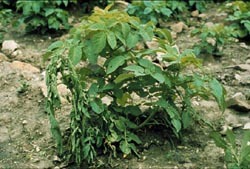 Potato plant showing wilting of one stem. severely wilted/stunted susceptible plants in the middle row.